Starting a podcast can seem like a daunting task. Once you figure out what you're going to talk about, who is going to be on the show with you, and what hosting service you're going to use, you need to figure out how you're going to record it. In my previous life, I was in a band and recorded a lot of music in my parents' basement. I already had a Shure SM58 microphone and the necessary accessories. It's not the best microphone for podcasting, but it sounds great and I didn't really feel the need to spend money on a new one. A podcast is all about your voice coming through clearly; the sound doesn't have to be perfect but it should be clear, and a separate microphone, be it XLR (like the SM58) or USB, goes a long way. Since I was using an XLR microphone, I did need to buy an audio interface. I chose the TASCAM US 2x2 based on Jason Snell's recommendation. I had used a TASCAM Portastudio for years before I started using a Mac to record music, so I knew I could trust the brand. It works well, and it provides more than enough gain for my voice to come in loud and clear. Ideally, you want to hear what you're recording, so I picked up the TASCAM TH-02 headphones. The price was right, but I find that they're a little too big. I may eventually replace them with something more comfortable, but for now, they're fine. A lot of confusion for new podcasters seems to revolve around recording equipment, but I was lucky enough to have familiarity with that part, so I was able to get past it quickly. My biggest questions were about the logistics of getting it all together. Brian's previous experience podcasting was a show that was recorded in person, with two other people. 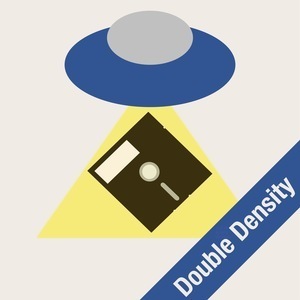 Double Density needed to be different, and we were going to have to record a "double ender." That is, we would each record our side of the conversation, and then one of us (Brian) would stitch it all together and produce something that people would want to listen to. To actually hear each other, we use Google Hangouts, although Skype would work just as well. We don't use that audio in the final recording, so it's fine if we hear some audio artifacts while we record. We chose Hangouts since Brian had had a better experience with it vs Skype. It works, and as long as you can hear your co-host, what you use doesn't really matter all that much. I do think that if you're going to have guests on often, Skype may be a better fit since it is more widely used. In our initial recordings, I used GarageBand to record my end of the show, and then I would share a high quality MP3 through Google Drive. However, I really didn't like recording directly into GarageBand. It created huge files that I really didn't want to deal with. I wanted something a little more versatile, and a little less bulky, for the lack of a better word. After doing a lot of research and seeing what a lot of my favourite podcasters used, I settled on Audio Hijack by Rogue Amoeba. The great thing with using something like Audio Hijack, is that I can create three audio files at once in case something goes wrong. I have it set to record my voice directly to a high quality audio file, as well as recording the entire call to a separate file. I'm also recording what I hear Brian saying in a separate file without my side of the conversation, so that if something goes horribly wrong with his set up, we have a backup. If you listen to the show, you know I'm all about backups. In the 17 episodes I've recorded with Audio Hijack, it has crashed once on me, and it still saved the audio up until that point. If you're willing to spend a little money on some software, Audio Hijack is where you should spend it, if you have a Mac. For now, I'm not editing the show, as Brian's previous experience editing a podcast comes in handy, and he's able to provide a quicker turnaround. All those fun bumpers and extras you hear on the show are his creativity. We're hoping to share the editing duties soon, and once that happens, I'll definitely be posting about it here. For now, I hope you find this peek into my workflow helpful, and if you have any questions, please let me know.